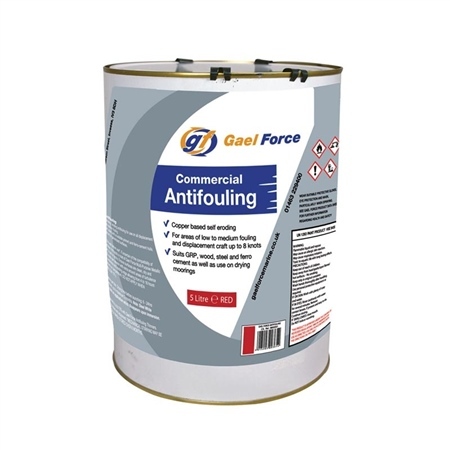 Copper Based Self Polishing/Eroding Commercial Antifouling for areas of low to medium fouling. Suitable for Commercial use on GRP, Wood, Steel and Ferro Cement as well as use on drying moorings. Not suitable for aluminium or galvanised surfaces. Directions for use: Stir well before use. Apply by roller, brush or spray. Ensure surfaces are clean, dry and free from salt. Apply 2 coats per season with extra around areas of turbulence such as rudder, keel, waterline and leading edge allowing from 4 to 16 hours between coats dependent on temperature. Coverage: 10sq. metres per litre. Drying time before launching: 6 - 24 hours dependent on temperature. Maximum time before launch: 2 months.